I have exciting news about ScienceOnline Oceans to share! General registration will start in a little over two weeks. As this is a little different from traditional scientific conferences, I’d like to explain the process in some detail. Registration will take place in four stages. 1) Session moderators and workshop leaders. If your proposal for a session or workshop at ScienceOnline Oceans has been accepted (more information on that soon), a spot is automatically reserved for you, and registration will be a separate process. Please DO NOT register through the regular process. 2) Open registration. Open registration will take place on Wednesday, May 8th. To accommodate people in different time zones, there will be two registration times: 9:00 a.m. EST and 2:00 P.M. EST. There are 50 available spots during each timeslot, and they are first come, first served. In the past, ScienceOnline open registration spots have filled up in as little as 5 minutes, so please be sure to be prompt! 3) Lottery. The remaining spots will be filled by lottery. If you do not get a spot during open registration, sign up for the lottery and we’ll get back to you soon to let you know if you got a spot! Please note that the lottery is for the opportunity to register, not for a free spot. 4) Waitlist. There is also a waitlist for those who don’t get a spot during open registration or the lottery. As additional spots become available due to cancellations, people will be accepted off the waitlist. The registration fee for students will be $150, and general registration will be $200. We accept PayPal and major credit cards. Registration is entirely online. 1) A discussion panel and opening social on Friday, October 11. Dinner and some drinks will be provided as part of the social. 2) Admission to the main component of the conference on Saturday, October 12th. 3) Breakfast, lunch, and snacks/coffee on Saturday, October 12th. 4) Transportation between the conference hotel and the Friday evening social venue, and transportation between the conference hotel and the University (where the Saturday program is taking place). 1) Transportation between the airport and the conference hotel. 2) Additional workshops you may sign up for on Friday, October 11th (fees will vary). 3) Dinner on the evening of Saturday, October 12th. We have arranged for reservations at a variety of fun restaurants within walking distance of the conference hotel, each hosted by an expert in a ScienceOnline Oceans topic. People can sign up for whichever dinner they like, however we are not covering these costs. 4) Field trips on Sunday, October 13th (fees will vary). 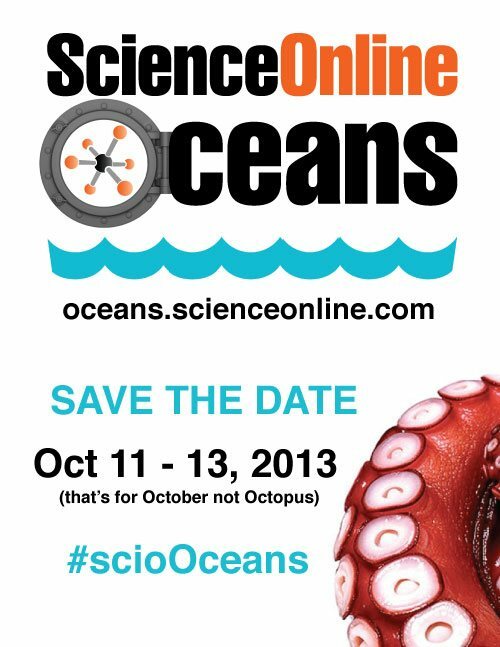 One month until ScienceOnline Oceans: Here's what you need to know!